This card started with a background I had made previously on THIS BLOG POST (directions are there). I used watercolors and texture paste with a stencil (SSS Medium Dots). I used a PPP Window Frames Die cut from white cardstock for the white part. I layered two of the patterned papers below. 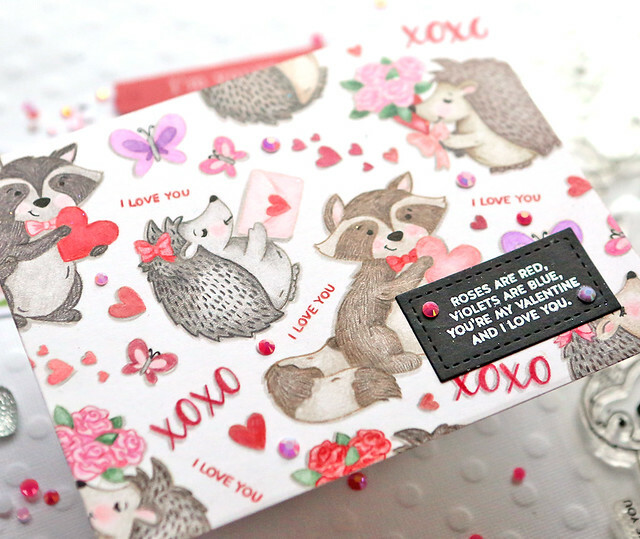 I stamped the sentiment from the smaller stamp set in the kit (3x4) on a banner by Honeybee stamps. I layered that over the two papers. I attached two Sparkling Clear Sequins to each end of the banner. 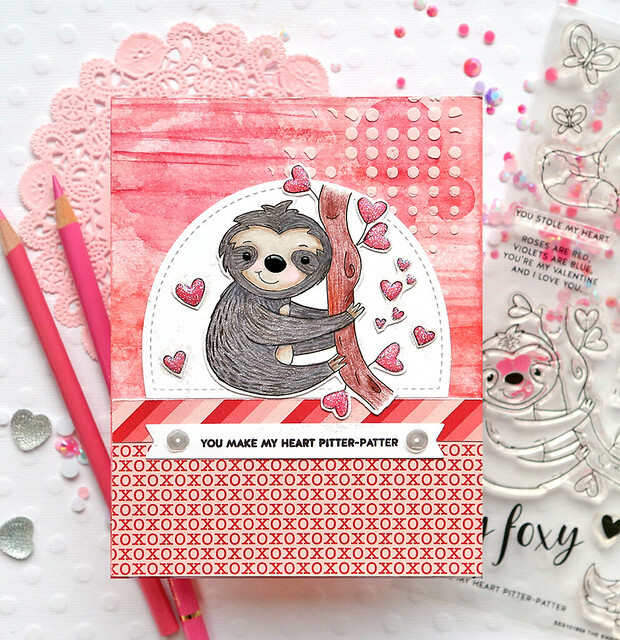 I stamped the hearts and the sloth stamp from the larger stamp set with MFT Natural Ink and colored them in with colored pencils. I doodled black lines around the edges. I covered the hearts with Glossy Accents and white glitter. I attached all of these images over the window frame die. I used Tonic Nuvo Drops in black ebony over the sloth's nose and eyes. This is my random stamped card which are my favorite to make because they are like a puzzle. I used MFT Natural Ink again for no-line stamping on white cardstock. I always use a Misti to do this type of stamping so I can line up several at one time. I added shadows behind each image with a gray colored pencil so they items look dimensional. I used some of the little sentiments in the design as well and just drew over the letters with a pencil. I stamped the sentiment "roses are red" on black cardstock and embossed it with white embossing powder. 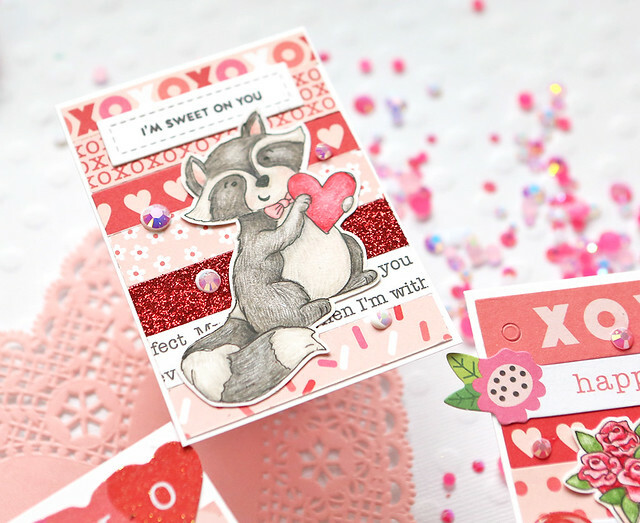 I added some of the PPP Valentine Jewel Mix around the stamps. 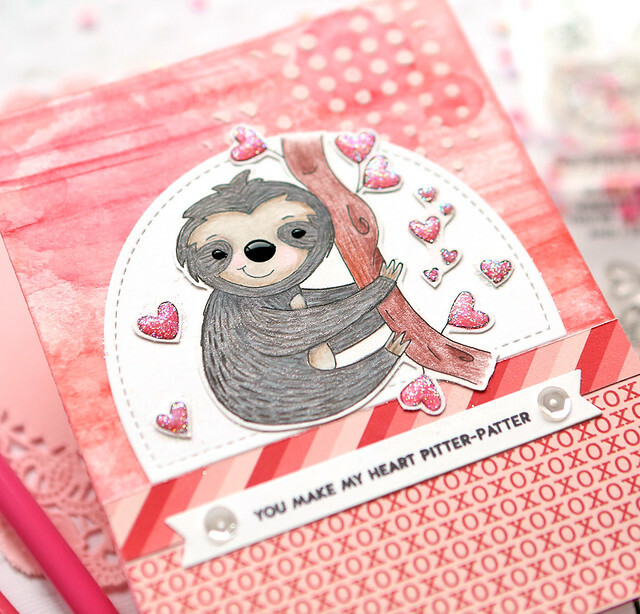 This heart paper was my favorite in the kit, so I wanted it to be the main part of one of my cards. I attached a full size piece to the front of a card base. I then die-cut a piece of the red glitter paper in the kit and attached that to the lower half of the card. I used a strip of the striped paper over where the two papers overlapped. I stamped the small sentiment from the smaller stamp set in the kit with black ink on the smallest Honeybee banner. I attached that to the center of the paper strip. 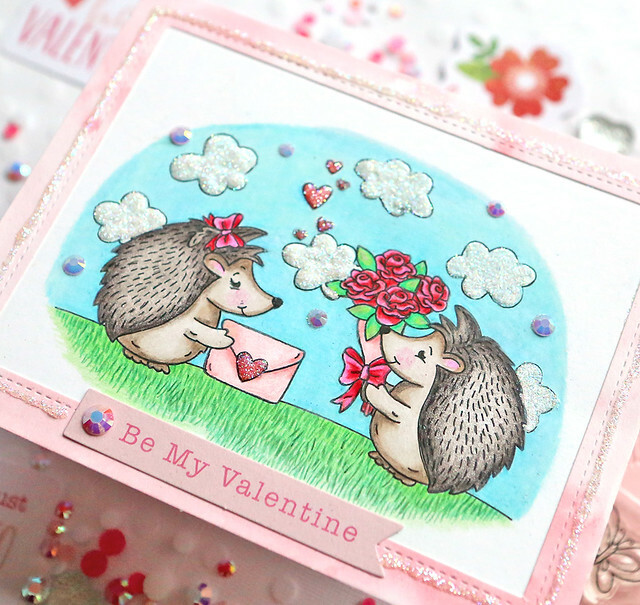 I stamped the two hedgehogs on white cardstock with MFT Natural Ink and colored them in with colored pencils. I then outlined them with a fine tip black marker. I used some Strawberry Coulis Jewel Nuvo Drops over the heart on the envelope. I attached some PPP white jewels around the hedgehogs and sentiment. 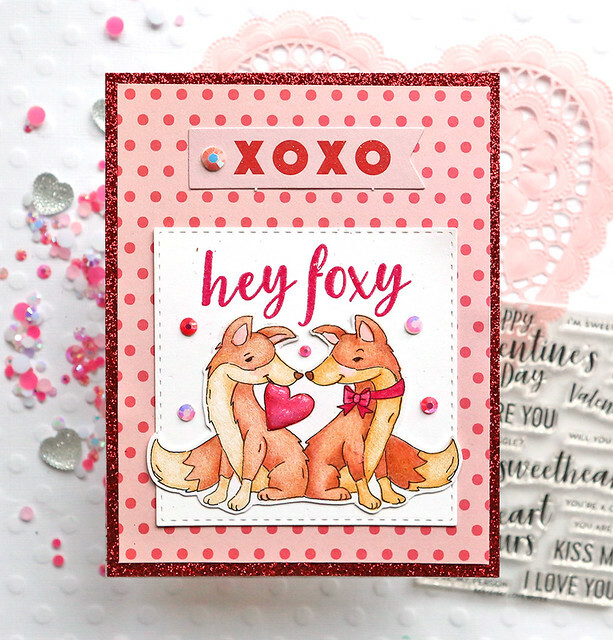 I love the fox in this stamp set and how there is a sentiment to go with each of the stamps in the set - so many sentiments in these two sets! I started with a full size piece of the red glitter paper (cut the inside of it out so you don't waste this nice paper!). I then layered a piece of the pink/red dotted paper over it. I die-cut a stitched square with the SSS Stitched Square dies and placed that over the bottom center. I attached an xoxo banner from the die-cuts in the kit over the top center of the card and used a white jewel where the hole was. I stamped the images with MFT Natural Ink on white cardstock and colored them in with colored pencils. I then outlined them with a black fine tip marker. The reason I do it this way is if you color with colored pencils, the waxy part covers your black stamped lines and it bothers me that they no longer show up. So I like outlining with a black pen that makes the lines all dark black again so they show up better. Hope that makes sense! Only some kind of black pens will draw over colored pencils since they leave a waxy finish, so I use Pentel Arts Hybrid Technica pens - my preference is the 05, but I also use the 04 and 03 - these pens are the BEST! But they do smear, so you have to be careful and let them dry or you have a mess on your hands. 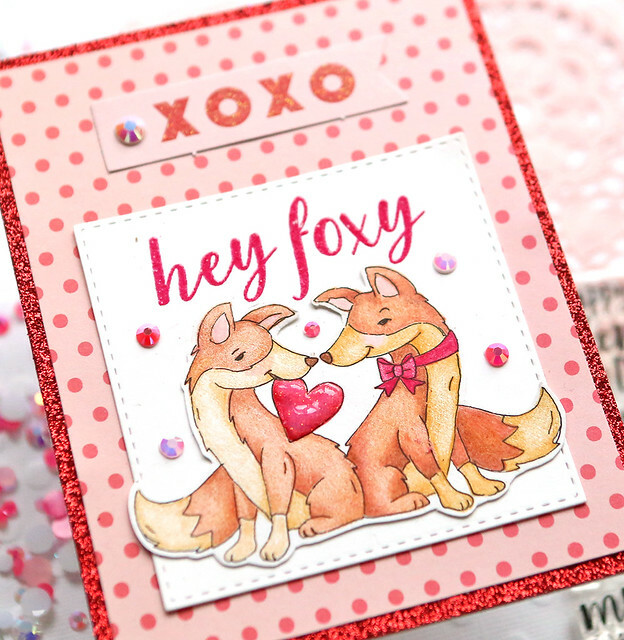 I stamped the sentiment above the fox using WOW Pink Lady embossing powder (white is really more red). 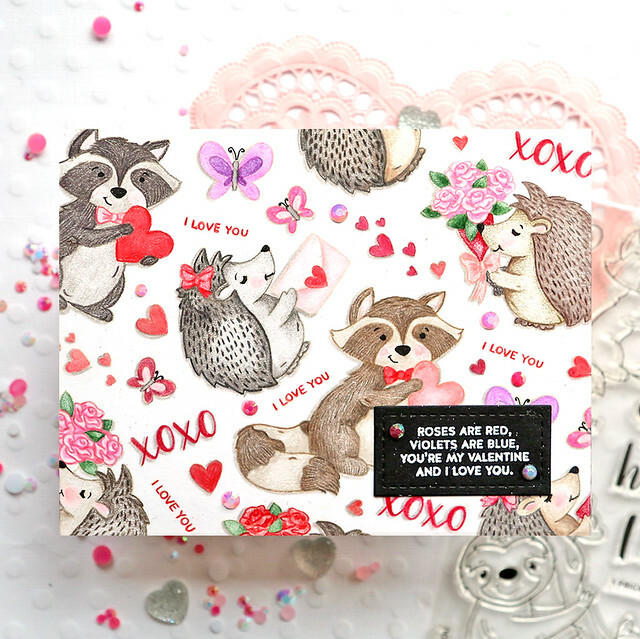 I added some more PPP jewels from the VAlentine's mix around the fox. This card was my most artistic, but it also turned out like kind of a mess hahaha! It looked way better before I used Glossy Accents and white glitter all over it and then kneeled on it with my knee. I now have Glossy Accents all over my Lulu workout pants and my card ended up with glitter everywhere and several squished clouds! Anyway, if you follow my blog posts, I always make my mistakes work, so I went with it anyway. The frame is from the PPP Stitched Notes die and I watercolored it. then I added a row of glossy accents around the outside edge of the stitching which turned out a mess as previously noted. I covered that with glitter (nice concept but could have been executed better). 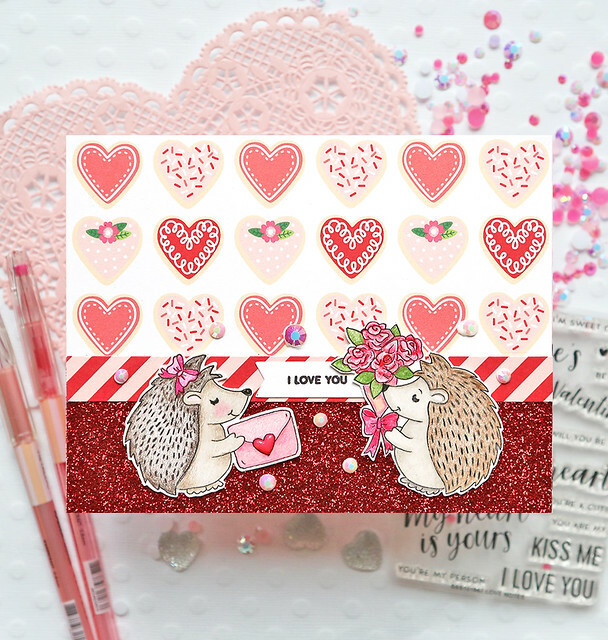 I attached a Be My Valentine banner from the die-cut set in the kit on the bottom and used a large pink jewell over the dot in it. 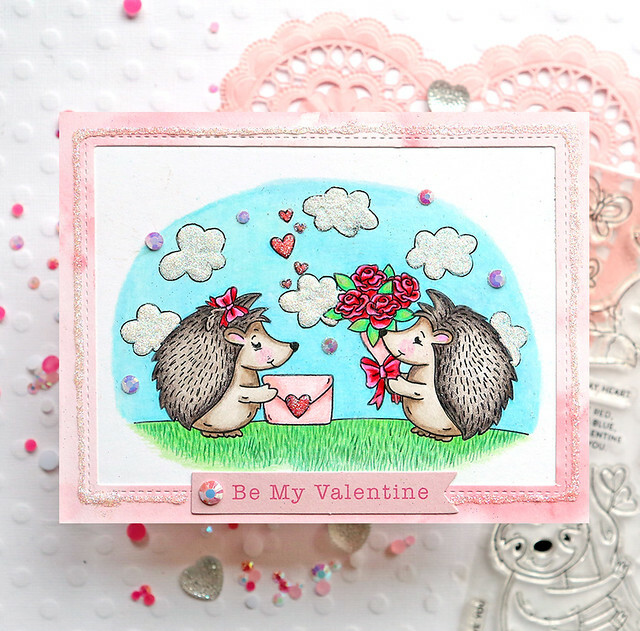 I stamped the two hedgehogs on a piece of white cardstock full card size with black ink (yep, black ink this time!!!). I then drew a line for the grass below them both. I stamped the small heart grouping between them. I colored them all in with colored pencils and then colored the grass and sky with pencils. I used several colors of green pencils to mimic blades of grass. I drew clouds in the sky with a white Uniball. Then I outlined them with a fine tip black marker. Next, I used white Nuvo Drops over them and covered that with glitter. I love how these turned out (even though I smooshed two of them!). I attached white jewels around the sky. There are two small sets of cardstock cards in the kit (just one flat piece, don't fold over) and two small envelopes. 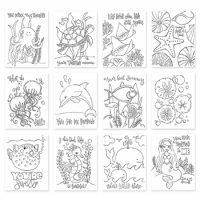 This little cards are perfect for small one sided cards for friends or for kids school classes. I covered all three of mine with little strips of the patterned papers as well as some of the die-cuts in the kit that are strips. I could have made way more than 3 as I had plenty of supplies left. 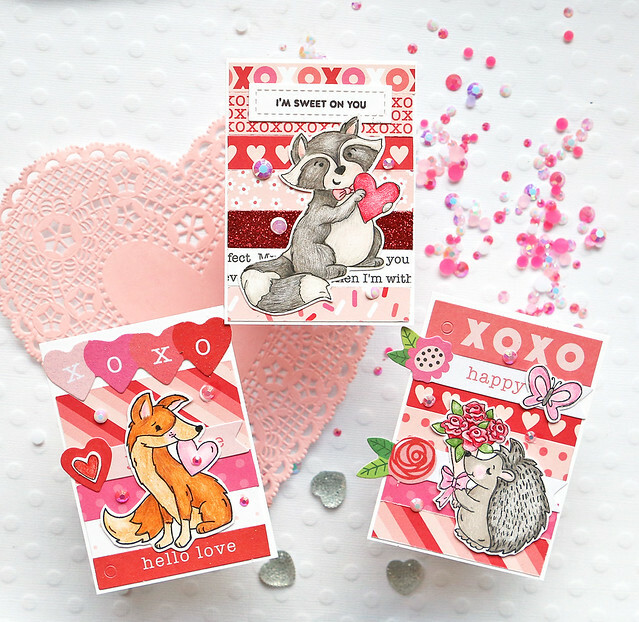 I stamped the three animals with MFT Natural Ink on white cardstock and colored them in with colored pencils. I then outlined with a fine-tip black marker. I attached them to the front of each small card. I stamped a sentiment on a small rectangle for the top of one of the cards using the small 3x4 stamp set. For the other two, I let the banners from the die-cut set be the sentiments. 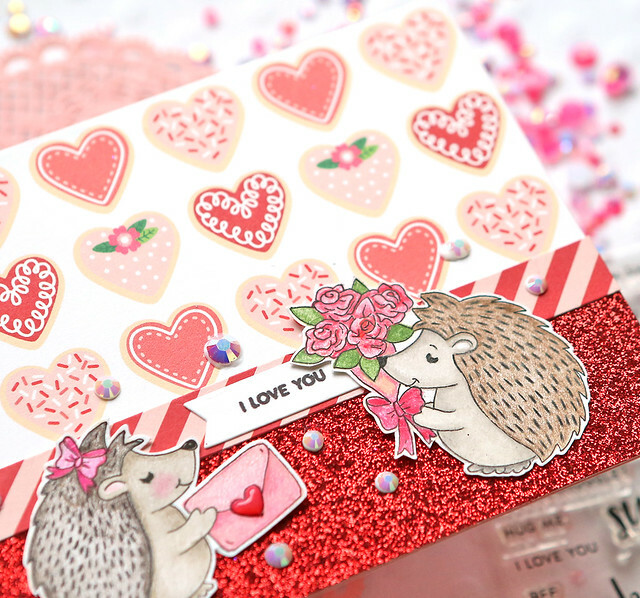 I love these little cards and want to make a whole bunch more of them!